Hippopotami and elephants don't have wings and can't fly, can they? 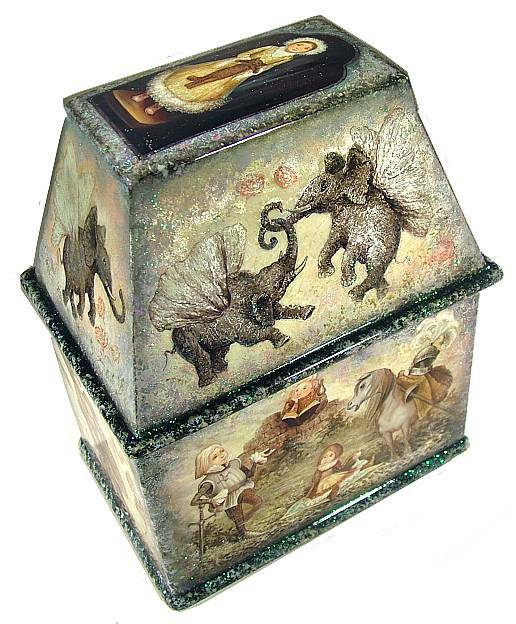 They can if you go down that rabbit hole into the world of Alice in Wonderland, and Fedoskino artist Oleg Yastrebov brings them all to life in this large casket which is bursting with creativity from one side to the next. 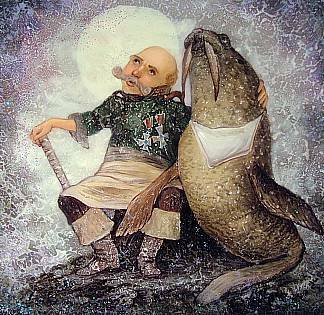 Each composition is drawn beautifully in Yastrebov's distinctive style and sprinkled with magical bits of glitter. 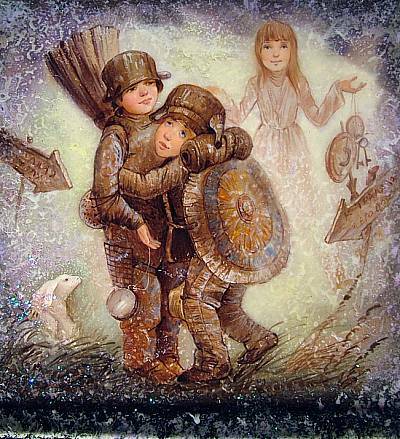 The faces on his character's, in particular, are quite popular among collectors perhaps because of the child-like innocence they seem to convey, and this look works perfectly for a fairy tale like "Alice". Each scene here (8 in all) would make a wonderful box in itself, but combined they add up to a spectacular and memorable work that would be the centerpiece for most collections. We confess that we haven't read the book that the box is based on for ages, so you will have to match each scene to the chapters of the story yourself. And it is quite likely that Yastrebov brought in his own fantastical elements, but they would undoubtedly be be right at home in the nonsensical story of "Alice". The box is made out of high quality papier mach, has a hinge, and sits on four small legs. The interior is red. We bought this one directly from the artist, but we are not able to find his signature on the box. However, there is a LOT of ground to cover on it, and the artist said it was hidden a bit. We will keep you posted (and probably erase these last two sentences!) when we find it. Regardless, it is unquestionably from Yastrebov's hand when you compare it to his works found in the recent books on lacquer box art, like the ones in "Russian Lacquer Miniatures, Palekh, Mstiora, Fedoskino, Kholui".